Considering The Bahamian Islands are only a mere 55 miles from US mainland, with countless islands to explore, they are a very frequent and popular destination for our multiple day charters. Popular destinations include: Nassau, Atlantis, Paradise Island, Exuma Land and Sea Park, Bimini, Abacos, Freeport, and Grand Bahamas. The 120-mile–long chain of islands is a boating and sailing paradise. Marsh Harbor has a lively downtown area with all city amenities. Treasure Cay boasts miles of pristine beaches, including one of the top 10 beaches in the world. Always home of the famous and impressive 7-mile–the long beach. Bimini is the closest Bahamian island to the United States, just 50 miles from Florida's coast. Rich in history, there are many shipwrecks in the area, like the SS Sapona, that are popular sites among scuba divers and snorkelers. The island remains a private club, but for visiting yachts entering The Bahamas it is an official port of entry for The Bahamas and Bahamas Customs and the Royal Bahamas Police Force are present on the island. Chub cay is a fisherman's paradise. Located at the southernmost tip of the Berry islands most notable for the extensive marine life, an abundance of coral reefs, world-class fishing. Chub Cay is just a short boat ride to the world's third largest barrier reef, the Andros Barrier Reef, where you can snorkel and dive to see some of the world's most exotic fish species. Compass Cay is notable for its naturally protected harbor. Also, has an impressive population of docile nurse sharks that have become an increasingly popular tourist attraction where you can swim with and feed the sharks. Eleuthera is wildly known for is its natural beauty and serenity. If you like the color of a turquoise blue ocean, pink sands, shock blue skies, warm weather, and cool breezes, Eleuthera Island is the place for you. Full of natural beauty with Massive cliffs and boulders thought to have been left by catastrophic tsunamis over 100,000 years ago line the shore adding to the stunning view of both the Atlantic Ocean and the Caribbean Sea. Freeport is the main city on Grand Bahama island. It's best known for the oceanfront Lucaya district, with beaches, resorts, and shopping. Nearby, Deadman's Reef is popular for snorkeling, and many dive sites. Up the coast, Lucayan National Park features extensive underwater caves, plus kayaking and nature trails. The Exumas are a group of 365 cays and islands, beginning 35 miles south of Nassau. With sapphire- blue waters and pristine coastlines make The Exumas - a Bahamian gem home to many private homes and luxury resorts. 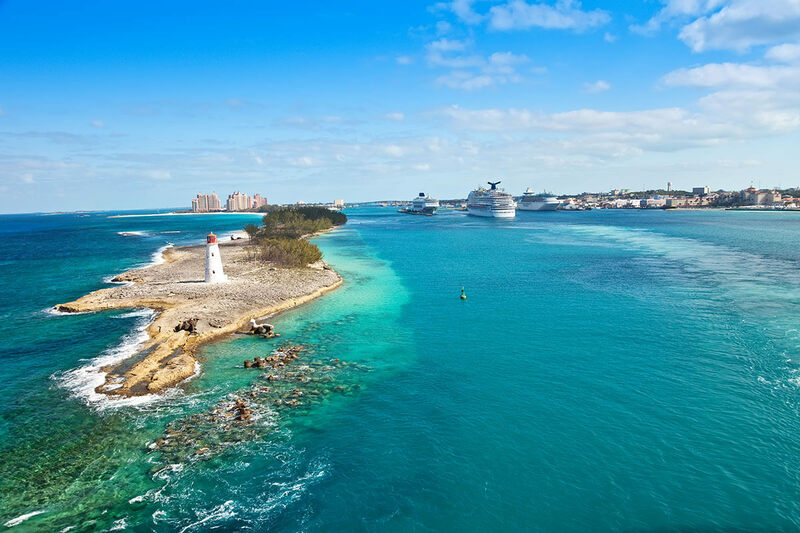 Nassau is the capital of the Bahamas, A popular cruise-ship stop, the city has a hilly landscape and is known for beaches as well as its offshore coral reefs, popular for diving and snorkeling. Lots of day excursions, snorkeling, paddle boarding, kayaking and other water sports available here among many other tourist attractions. The privately owned island welcomes yachtsmen and guests to its first-class marina and luxury cottages. Highbourne’s eight beaches. are deserted pieces of paradise, all within walking distance of the Marina, complete with breathtaking views and laid back luxury. Staniel Cay is infamous for more than just the plethora of shallow, crystal clear waters. There are plenty of activities to do to enjoy the area. For snorkeling enthusiasts, there is Thunderball Grotto, known worldwide as an outstanding snorkeling attraction. Just around the corner are Big Majors, better known as, Pig Beach. Here, you can feed and swim with the wild pigs that inhabit the island. In addition, there's amazing fishing (local guides available) of all kinds; saltwater sports fishing, bone fishing, deep drop, etc.